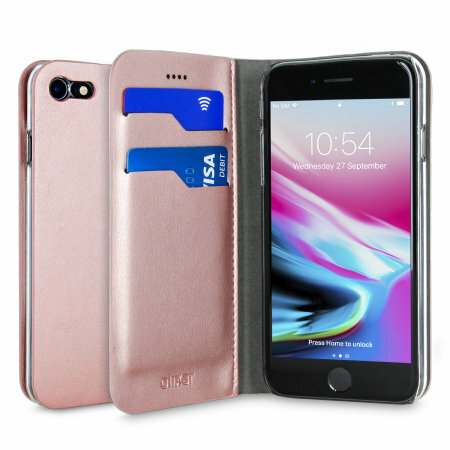 Protect your iPhone 8 with this durable and stylish rose gold leather-style wallet case from Olixar, featuring two card slots. What's more, this case transforms into a handy stand to view media. My Rose Gold phone cover looks really smart and is very functional with the areas for my credit cards, myki etc. I've had quite a few comments and compliments too! Good quality product and very speedy service. Thank you. The wallet part broke/unpeeled within a day of placing cards in. This is a terribly made phone case. Iâ€™ve only had it a week and already the edges of the faux leather case are peeling. The hard plastic cover that the phone sits in is coming unstuck from the wallet case and it has also cracked in two different places. One week later and Iâ€™m already searching for a new case again. Great iPhone case that protects your phone well and has two pockets for cards. I was hoping for a strong magnetic catch for closure otherwise the product is fine. After just 2 weeks lovely looking case is falling apart on the fold and although there are cards slots, would have preferred opening to slip money behind. Like the colour. materials and fit of case. Cover doesn't always stay closed. Nice fit. Stand does not function properly but that’s not what I wanted from the case. I am very happy with tthe cover it does excatly as described. Delivered quxckly as promised. The case split where the credit cards go after only a week. I only had one card in each slot so they weren’t stretched. Sorry to hear you are not happy with this case. This may have been faulty to start with, could you please contact our Customer Services team so we can look into this for you. Good and prompt response from customer service when I needed to cancel and re order. Received the product on time. It's already chipped where the phone sit inside in the clear plastic case. Very nice case - fits well - shows off the Rose Gold on the phone well and makes an attractive ensemble. Great product very stylish. Colour (rose gold)matches phone perfectly.Easy to fit and feels very secure. Phone is still very slim. Stand works well too. Great case same colour as phone -love it! Bought as a gift for my girlfriend and she loves it. Looks good and good value for money. I love my rose gold phone case. I was super happy that it arrived quickly and it meets all my expectations. Item was exactly what I was expecting and at a great price. Very neat and smooth and not at all bulky. This cover is perfect for my needs. It is the same cover as my phone and is sleek in design and is great. Great case for the price. Perfectly matched my IPhone 7 Rose Gold. Enough room for a few credit cards and drivers licence. Looks good but doesn't stay closed. Looks great and fits phone well but the case does not stay closed so have to put phone face down all the time. Think the magnet is not strong enough. Very pricey for something that doesn't actually work all that well. Save your money and buy s cheapy elsewhere. I love that this is the same colour as my phone and holds a couple of credit cards. It protects my phone well and I can still use all the buttons well.